Zorex and Arca Systems offers a comprehensive range of stack nest containers, which save on packaging costs.These containers are suitable for the distribution of goods in a variety of industries. They optimise space utilisation when nested for distribution but take up 70% less space when nested for return or storage. 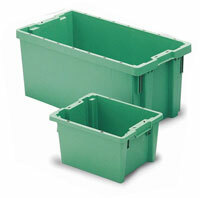 All containers in the range are produced in food approved, recyclable Polypropylene. They are all available with either perforated or solid sides and bases, with capabilities from 18 to 87 litres. Copyright 2016 Powered by Zorex Distributors LTD.